Help support local residents and business affected by the Napa Earthquake by making a donation to the Community Disaster Relief Fund. In the spirit of neighbors helping neighbors, the NVV is committed to helping the Napa Valley community recover from the August 24 South Napa earthquake. We provided the $10 million lead gift to create the Napa Valley Community Disaster Relief Fund, which is managed by Napa Valley Community Foundation. For Napa County residents, funding will be available for one-time immediate needs as well as short term assistance for things like temporary housing; basic needs (food, water, etc. ); medical care and counseling; and repairs for immediate safety concerns, like replacement windows, debris removal or fallen chimneys. For local businesses, the Fund will provide assistance to help them get them up and running, allowing employees to return to work and local commerce to continue. Area nonprofits can use funds to help them to restore operations and can also apply for general support grants to serve earthquake victims. If you are a homeowner, renter, business owner or nonprofit that has been adversely affected by the quake please view information on grants and grant eligibility guidelines. Questions can be directed to karla@napavalleycf.org or 707.254.9565 x 10. The NapaLAC (Local Assistance Center), located at 301 First Street, Napa, provides services including city and county building permits and financial assistance, food assistance, family resources, mental health and other community resource programs. 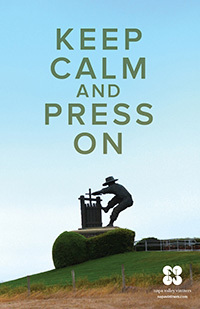 Napa Valley is staying strong and moving on – download our free, inspirational poster.